In production is our new industrial Ethernet controller TCW220. It is entirely directed towards solving problems for industrial automation. The industrial Ethernet controller has a data logger for all monitored parameters. The records can be made on a certain time, upon the occurrence of a predetermined alarm condition or both. File with last records can be sent periodically by HTTP Post to a dedicated server. The entire log file can be downloaded. Analog inputs of the industrial Ethernet controller have 10-bit resolution and range from 0 to 10VDC. This enables direct connection of various industrial sensors with analog outputs. 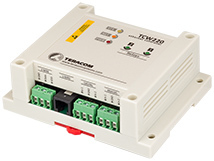 TCW220 supports a 1-Wire interface. It carries up to 8 sensors for temperature, humidity, direct and alternating current, 0-20mA, a concentration of carbon dioxide etc. The industrial Ethernet controller supports MODBUS, SNMP and HTTP API protocols for M2M communication. More information about TCW220 can be found on its product page.